Saucisson sec, day 5, originally uploaded by Seligmans Dog. Been maintaining 70+ %RH for 5 days now. The sausages have dried down quite a bit and a slight bit of characteristic mold is developing on the casing. Things are definitely looking better this run than last. The dog is still curious about them, but has not been able to get an opportunity to rip them apart. I can practically taste the burgundy and bread to accompany this treat. Looks great. 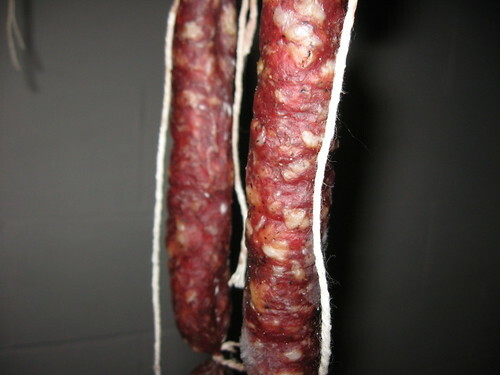 I'm still not sure why no bacteria is needed for this particular dry cured sausage, but are common in others. Neither do I. You still have some of the bactoferm? I'm considering buying some of the 44 mm casings and making some sopressata. Maybe we can split a pound of the big casings. Yum! Looking good! I have just cracked into my bacon...and I am hooked. I can't wait to actually stuff sausage. BTW, how long will those casings last in the fridge? I read quite awhile, which I hope is true as they have been there for several weeks. Guys at the supermarket said to drain off most of the water, pack the rest in salt, put in fridge and should last a real long time. Mine are sitting in the fridge now. I really want some of the fat ones. Once they dry down, they really get thin. Dave-sounds good to me. I wouldn't mind having them for making other things like summer sausage.